congratulations to the whole socirc commmunity! Thanks to our amazing youth show "The Carnival of Life", the spectacular performances through the evening by 6 amazing professional circus artists, all of our on, and off sight volunteers, our SoCirC team , our auction/food and drink donations, everyone who came out to support & have fun, Astrid and Jason for the footage, and those who couldn't make it but made monetary donations!! Thanks to everyone who contributed, we will be starting up our social support program through circus arts again this April, 2019! Program starts April 30th at 7pm at MLSE Launchpad for young people 16-29. Please get in touch for more details. Watch out for us performing mid day at May Pedestrian Sunday in Kensington Market! click the icons to follow us on instagram and like us on facebook! 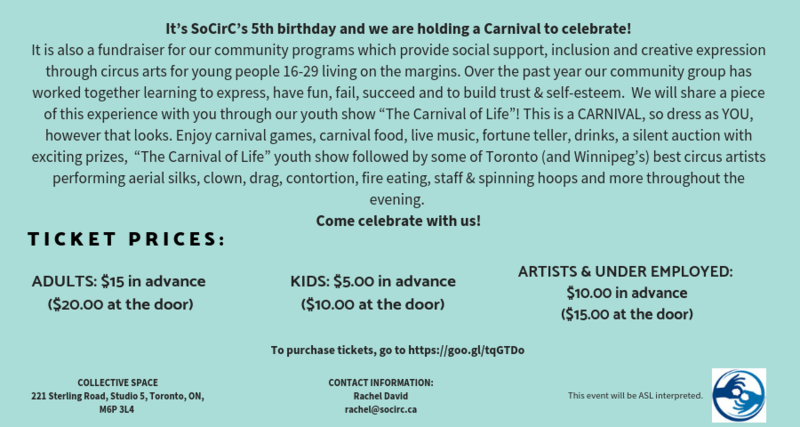 SoCirC (Social Circus Circle) is a Toronto based, charitable non-profit organization, that uses a social circus modality, providing social development and support through the physical activity and creativity of circus arts, for young people living on the margins, 14-29 years old. The concept of "Social Circus" is a growing movement active in many countries around the world, including (but not limited to) South Africa, Australia, Belgium, Burquina Faso, Canada, Cameroon, Chile, Colombia, Brazil, and the United States. Canada's own Cirque Du Monde, the social action department of Cirque Du Soleil, and an official partner of SoCirC, and is at the forefront of this movement and supports the practices of social circus programs in 15 different countries and over 86 communities, including SoCirC, here in Toronto. Social Circus is simply the concept of using circus arts as a tool for social change. 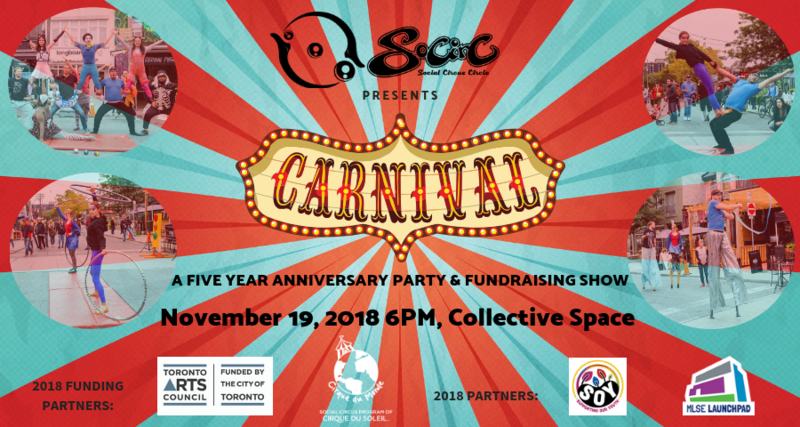 SoCirC was initiated in 2013 and built by Toronto based social circus artist facilitators coming from working for many years with Cirque du Monde projects (and other social circus initiatives) globally, and across Canada. With the desire to serve our local Toronto communities with this successful Cirque du Monde social circus model, SoCirC was born. SoCirC has been running our not for profit community and school programs since 2013 and in April 2016 were officially incorporated provincially as a charitable non-profit and also with Canada Revenue Agency in July 2017. ​SoCirC works in partnership with several community-based agencies and specialized alternative secondary schools that service youth with a variety of needs. Our community partners include SKETCH: a Toronto program bringing arts to street involved youth, hosts our annual spring RED LIGHT PROJECT, and Kensington Pedestrian Sundays where our group has an opportunity to perform at the monthly pedestrian street festival (supported by the Toronto Arts Council). Another community partner, The Art Gallery of Ontario's hosted our first community drop in programming for young people: Free After Three. In addition, through the support of the Ontario Arts Council, we bring programming to TDSB public alternative and unique secondary schools, including The Triangle Program (Canada's only LGTBQ2S high school), Oasis Alternative: Arts and Social Change Program, Heydon Park (credit and non-credit programs), Contact Alternative, Quest Collegiate & Addictions Recovery Program, The Aboriginal Education Centre, Central Tech Special Needs Program, ODSS Special Needs program. As such, we access and build relationships with a diverse range of participants in our programs, primarily young people dealing with mental health issues, street involved youth, LGTBQ2S youth, indigenous youth, youth coping with addictions, newcomers, youth with intellectual disabilities, youth with complex needs or any young person who can really benefit from an inclusive and safe space. -our primary goal is to foster social development and provide support, more specifically building the ability to trust oneself and others, communication skills, self esteem, teamwork, sense of community, improve body image, healing artistic expression, resiliency, risk management, perseverance and creativity. This is done by creating an inclusive safe space, integrating dialogue in circle, social support, trust exercises, social games, and through the diversity of circus arts. ​-we focus on process using performance opportunities simply as an opportunity to exercise creativity, to work together, build confidence, over come fears, create goals, have fun, be seen with a new lens, and interact with the larger community around them. Process is the focus and performances are always optional. -we target young people 14-29, who lack access or for various reasons, and can really benefit from this adaptive, inclusive, participant based program (see more about the different populations we work with above). Although circus is a natural fit for the openness and playfulness of younger kids, it is common in teenage years to lose that playfulness and become closed to support. We think it is never too late for play, and believe our approach can slowly remind teens, and young adults the importance of play and allow participants to have fun, and be open to social support. -trained social circus artist facilitators run the workshops incorporating participation from community workers, counselors, social workers, not only for the social support when needed, but to create new links and relationships with participants building trust allowing flow of communication and understanding when needed. -participation is ALWAYS VOLUNTARY. Each individual is ready in their own time, physically or emotionally and we encourage participation in a variety of alternative way to accommodate the participants needs. -Workshops are participant based and tailored to the specific needs and interests of each individual and group as a whole. We incorporate the artistic and physical skills and interests participants already have, meet them where they are at emotionally introducing them to new unique skills and forms of expression at their own pace. -we use the range of circus skills to reach the diversity of participants (from pyramid building, partner balancing, clowning, theater, dance, juggling, aerial, music or plate spinning )there is something for everyone and every skill set) and also include interactive social games, and trust and team building exercises. Participants are also invited in follow-up discussion and sharing in circle to reflect on their experience, and incorporate and share some of their own artistic and physical skills with the group, and the facilitators become the learners, and the participants the skill sharers. Since circus arts includes artistic expression, humour, as well as physical activity, social circus becomes a perfect tool to act as an entry point for participants to diversify their interests with some discovering their athleticism for the first time and others finding new outlets for creativity and self-expression. Social circus creates an opportunity for participants to find their niche and celebrate their diversity while being part of a united community working towards a larger goal. As such, our programs encourages autonomy as well as allows participants to experience a sense of belonging to a community. Traditionally, circus was performed on a circular stage (or multiple circular stages - hence the expression "like a three ring circus". Toronto's circus community emerged in the 1980s when performer, one of SoCirCs lead Social Circus facilitators and founder of the Ontario's first circus school, Marsha Kennington, began running recreational circus classes as part of the Harbourfront Centre Programs. Marsha always used the "Circus Circle" as a way to bring groups of children together. The circle is an integral part of Social Circus, and all of our workshops begin and end with participants gathering in a circle. This provides a way for us to see and acknowledge each other in a space where no one is in front of or above anyone else. In a circle, we are equal and connected to one another and can share openly. Our circle of community also encompasses the many other kinds physical, social and artistic youth programs present. These are programs within the non-profit sector, community centres, and schools with whom we try to partner with to share and create social projects. Our program is focused on leadership development, which naturally has a cyclical nature as the student eventually can become a leader, and can sometimes even acquire the skills to become a teacher to their own instructors! We also recognize students can provide instructors important lessons during the workshop process. There is a circular flow of learning, and when instructors teach a certain set of skills to the youth, it is important to keep themselves open to learning from their students as their life experience infuses their practice of these new skills.